Two Lewis Hill goals earned Lanark United a vital 2-1 home comeback win over Johnstone Burgh on Saturday to maintain their eight-point lead over Lesmahagow at the top of League Two, writes Craig Goldthorp. 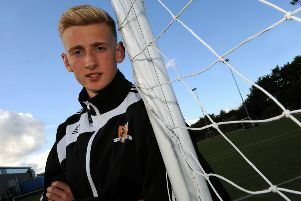 “Lewis was outstanding and scored two excellent goals,” United kit man Craig Martin told the Carluke and Lanark Gazette. “He keeps getting switched back and forth between midfield and up front and did a great job in place of Ian Watt who was suspended. “It’s ideal to have the title in our own hands with four games to play. “I was speaking to ex-Lesmahagow player Daryl Meikle who said ’Gow are calling us ‘The Comeback Kings’, because every time they see that we’ve gone a goal down we come back to win! Lanark were well on top during a one-sided first half at Moor Park on Saturday and produced several scoring chances, writes Tam Anderson. On eight minutes a free-kick by Cammy Lawson beat the defensive wall but hit the side netting before a shot by Lewis Hill went wide of the post. Hill then headed a left wing cross past the post. But Lanark were shocked on 44 minutes when a long ball out of defence found the United rearguard posted missing and Paul McCallum ran through to lob the ball over the Lanark keeper into the net. Lanark started the second half in determined mood and equalised on 53 minutes when Hill netted a powerful drive after good play by Stuart Annetts. Two minutes later Hill was again in a good position to head home a right wing cross to put United ahead. Cammy Lawson then came close with a free kick from the edge of the box which went narrowly over the bar. Lanark again produced scoring chances and the visitors failed to trouble the home defence unduly as three more points were added to the total with only four games left to play. Team: Hallford, Gracie, Taylor, Haddow, Lawson, Annetts, McHugh, Fraser, Hill, Kerr, Martin. Subs: O’Donnell, Lafferty, Anderson, Callan, Strang. United host Saltcoats Victoria in the league this Saturday, kick-off 2pm.